New ritual: I begin my desk-time by lighting a candle. The expectant flare of the match and comforting flickering flame marks a small opening moment to help me begin. 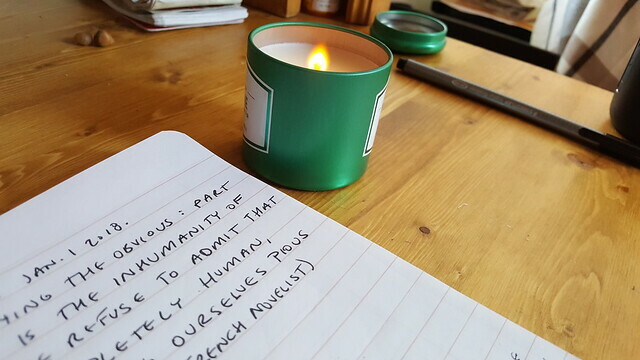 The candle, which I almost felt ashamed of purchasing (impulse buy; no reason why; it was on sale), is suddenly useful, a tiny reminder of the word I’ve chosen to meditate on for this year: perhaps as a guide, perhaps as warning. Even the tiny flame of a single candle is mesmerizing, its movements mysterious, its light enticing. The word fire initially drew my attention because I was thinking of creative fire, of passion, of burning brightly in pursuit of art. Which sounds howlingly pretentious, I realize. But I felt comforted by the image that accompanied the word: of a furnace, deep inside, glowing with steady bright heat. Fire is dangerous, as elements are. I pictured, too, a fire that burns across a prairie, leaving behind blackened space, but also a place for new growth in fertile soil — not a wasteland, after all. Fire is sacred, precious, life and death. Without it, we would be hungry and cold in the dark. A fire either is, or is not. When I blow out this candle, its flame vanishes. What keeps a fire alive? It needs oxygen to burn, and energy. It devours fuel. Some fuel burns bright and quick, while other fuel burns slow and steady. But in time, all fuel will run out and must be replenished. You can’t leave a fire untended. It will burn out, or burn out of control. Either way, it needs attention. What fires am I tending now? What feeds my fire? I think of the story of the Little Match Girl, which I adored as a child of melodramatic bent. How the brief flame of each lit match gave the girl temporary comfort and relief — and visions of warmth and plenty — even while she froze to death, shoeless, in the street. Fire as illusion of heat. Fire as passion, fire as creative, fire as necessary; fire as destructive, fire as hungry, fire as all-consuming, insatiable. I fear this word and yet it draws me. What would happen if I let my fire burn? What does that even mean? Do I know? PS The cartooning project continues, day by day. I’m posting a daily cartoon on Twitter and Facebook, and plan to use some here too, in future posts. I couldn’t think of a word, until the other day, when one came to me in the recording of the podcast I do with my brother. We had a fireplace burning in the background, funnily enough, and I thought of the fire stoker. I know stoker can mean one who stirs things up, and I am not one for that in a negative way, but perhaps this is my year to stir things up, in a positive way. I am speaking up more with the Canadian Federation of the Blind after all. I do like that your word and mine are so close. What a coincidence. Love fire and all its meanings. Wonderful, Kerry! It sounds like we’ll both use the image of a fire to keep our words close. “To stoke” is to add fuel to the fire. I hope you stoke much positive change this year. I think fire is an inspired choice and that my word of the year will be ‘flame’. I will go buy a candle to light before working in my studio space. Have a firey , warm year Carrie. Excellent choice, Bunty! I’m loving lighting a candle while I work. It’s especially stirring and comforting at this time of year. I find picking a word for the year so hard but I love yours. I’ve chosen two words for the year which are Focus and Feel but honestly I think Fire is a better fit because it kind of entwines the two. You are welcome to use Fire, too, Melanie. It would be interesting to see how the word accompanied you through the same year. Also interesting to reflect on the way both Focus and Feel relate to Fire.